Description: Small round aqua coffee cup saucers with a recessed circle in the center to hold a coffee cup in place, and 5 dots and flower imprints around the rim. Measures 3-1/2" diameter. Marked "©1982 FISHER-PRICE TOYS" on the bottom. Description: Small round blue tea cup saucer. No texture nor design. Description: Small round turquoise-blue saucer with a round indention in the center to hold a coffee cup and slightly raised sides. The edges of the saucer are scalloped. 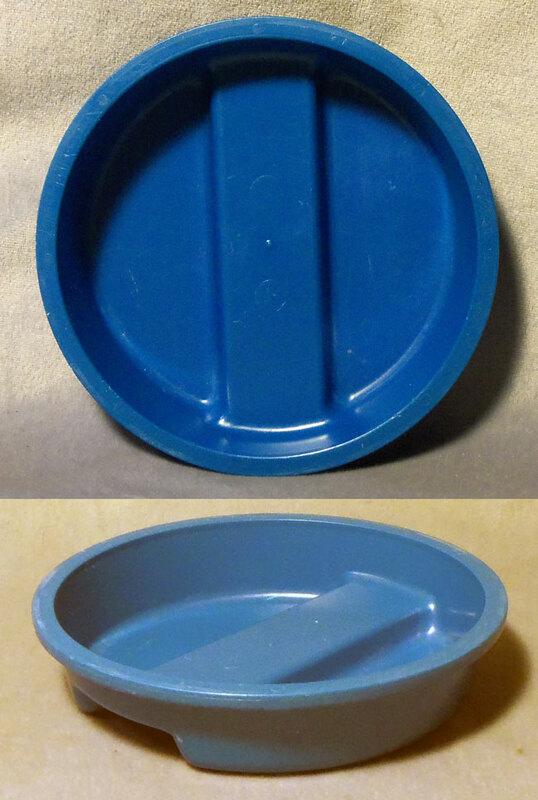 Description: Round shallow blue plate/pan/divided dish (no handle) with 2 shallow half-circle divided compartments inside. Red handle on FPT7354 plate/pan fits across the bottom middle gap on bottom of the plate (to store together with the FPT7354 plate/pan). 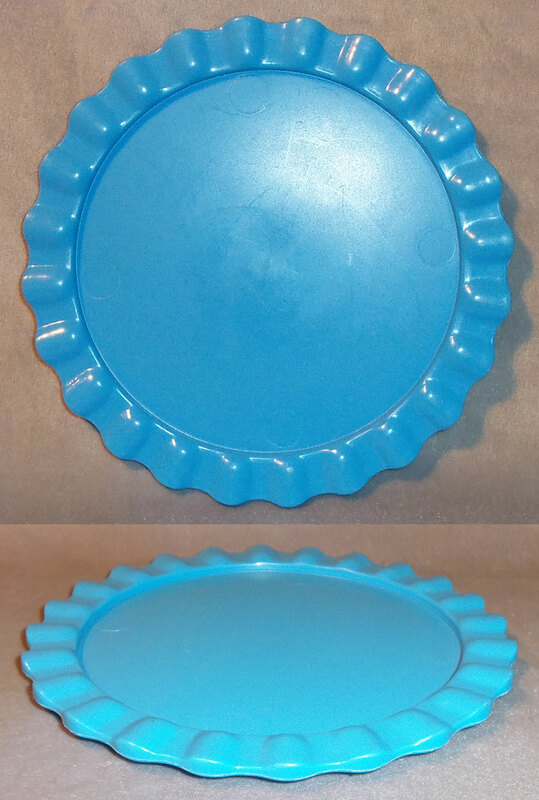 Description: Round blue plate with a slightly raised edge. The raised edge has a slightly textured top around the rim. Bottom of plate is marked, "F-P TOYS". Measures 4-5/8" diameter. 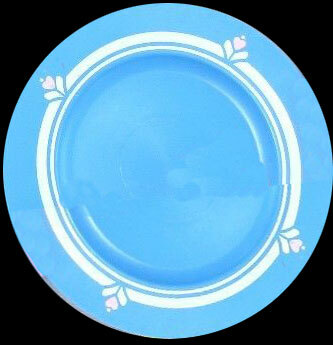 Description: Round blue plate with a slightly raised edge. The raised edge has a slightly textured top around the rim. The inside rim of the textured top has 2 smooth rings and a smooth heart with 2 "leaves" below it on 4 sides of the plates. Bottom center of plate is marked, "F-P TOYS". Measures 4-5/8" diameter. Description: Round blue plate with 2 pink rings (light and dark pink) around the edges. The plate has a design on 4 sides of a pink heart with 2 light pink "leaves" below the heart. Measures 5-3/8" diameter. Description: Round blue plate with 4 apples and checkerboard imprints around the edges. Back of plate is marked, "©'98 F-P, INC., CHINA". Measures 4-1/2" diameter. Description: Large round pink cake plate. About 5/8" of the outside edge of the plate is scalloped. Four cake quarters can fit on this plate. Bottom of plate is marked "2152, ©1987 FISHER-PRICE, DIVISION OF THE QUAKER OATS CO., MADE IN U.S.A.". Description: Round blue musical cake plate with 2 small handles (one on each side), and a 1 to 2 inch tall round blue cake topper holder in the center of the plate. 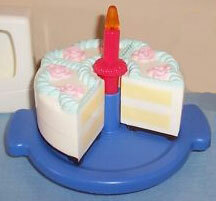 The musical cake plate plays "Happy Birthday to You" and plays "Here Comes the Bride". Requires two AA-size alkaline batteries (not included). 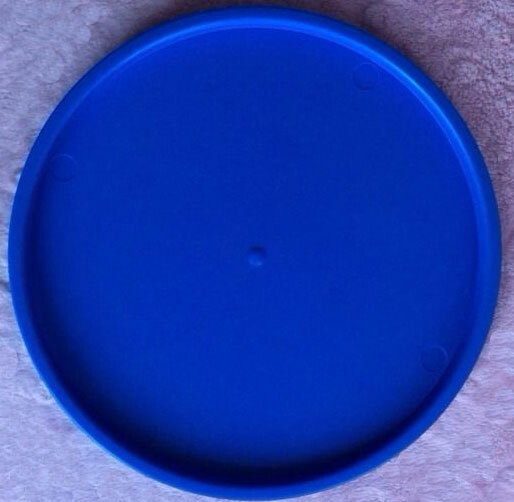 Description: Large round blue pizza plate with slightly curved up edge. 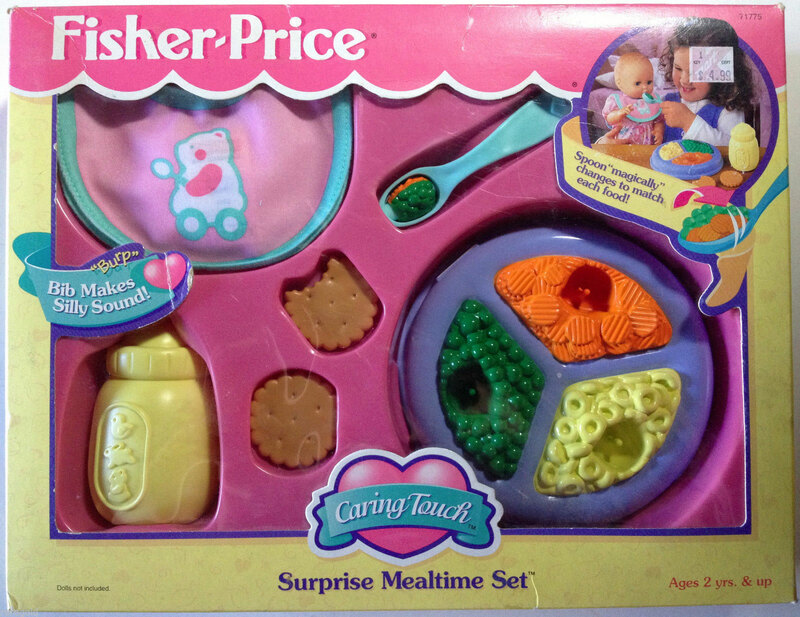 Bottom of plate is marked, "Fisher-Price". 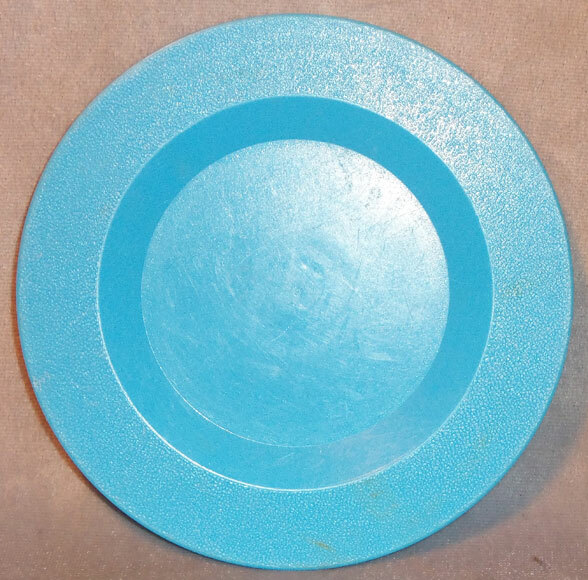 Description: Round light blue plate with no decorations nor imprint molds. The edges of the plate are slightly raised higher than the center of the plate. Description: Round bluish-purple baby warming dish with 3 compartments that have permanently attached pretend baby food in them: peas, carrots, and cereal. Each food serving has a round hole in the center that a "magic" spoon dips into. 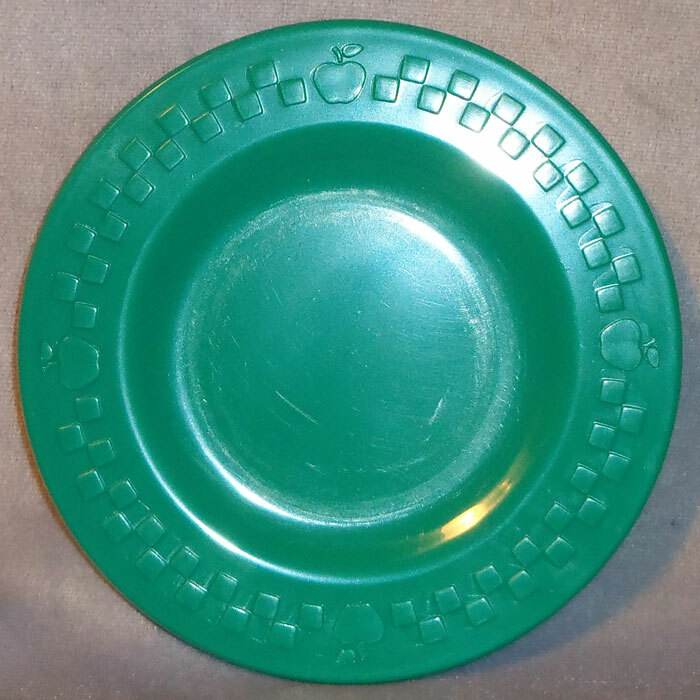 Description: Round green (dark green) plate with 4 apples and checkerboard imprints around the edges. Back of plate is marked, "©'97 F-P, INC., CHINA". Measures 4-1/2" diameter. 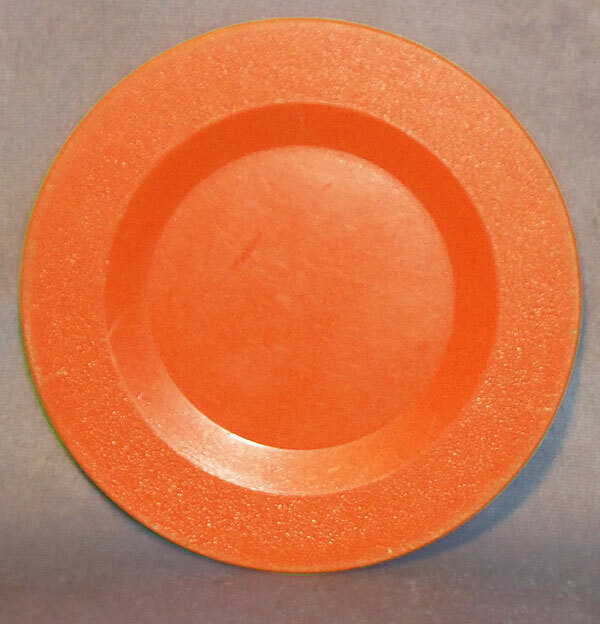 Description: Round orange plate with slightly raised edges. The top raised edges have a slight "stucco" pattern/texture. Bottom center of plate is marked, "F-P TOYS". Measures 4-5/8" diameter. Description: Small round orange coffee saucer with slightly raised edges. The top raised edges have a slight "stucco" pattern/texture. Bottom center of saucer is marked, "F-P TOYS". Measures 3-1/2" diameter. 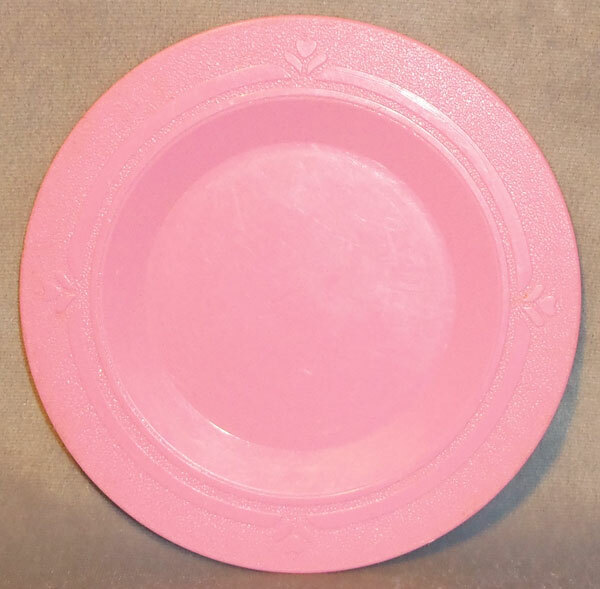 Description: Large round pink cake plate. About 5/8" of the outside edge of the plate is scalloped. Four cake quarters can fit on this plate. Measures 6-1/4" diameter x 3/8" tall. Bottom of plate is marked "2152, ©1987 FISHER-PRICE, DIVISION OF THE QUAKER OATS CO., MADE IN U.S.A.". 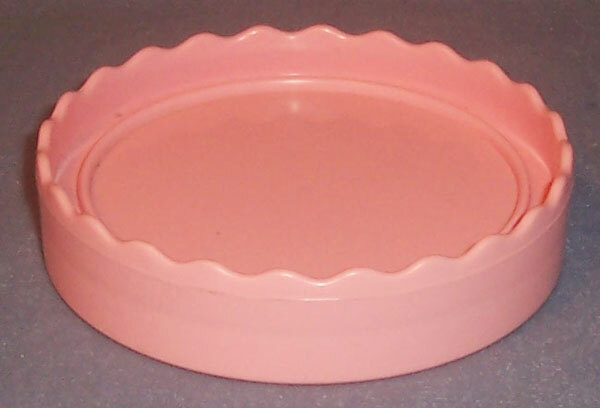 Description: Small round pink cake plate with a 1/4" to 1/2" raised lip around the outside edge. The top of the raised lip has a scalloped design. 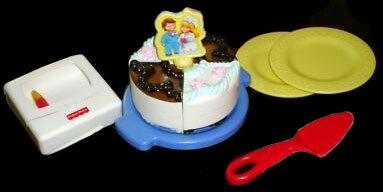 Plate doubles as a lid that attaches to the FPT7164 Cake for storing accessory cake toppers/decorations. Measures 3-5/8" diameter x 7/8" tall. Bottom of plate is marked "©1987 FISHER-PRICE". 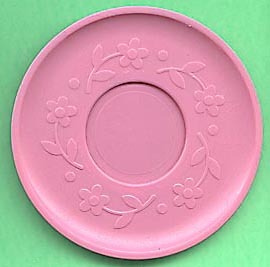 Description: Round pink plate with a slightly raised edge. The raised edge has a slightly textured top around the rim. The inside rim of the textured top has 2 smooth rings and a smooth heart with 2 "leaves" below it on 4 sides of the plates. Bottom center of plate is marked, "F-P TOYS". Measures 4-5/8" diameter. Description: Round pink coffee cup saucers with a recessed circle in the center, and molded flower imprints around the rim. The bottom of the saucer is marked "©1982 FISHER-PRICE TOYS". Measures 3-1/2" diameter. 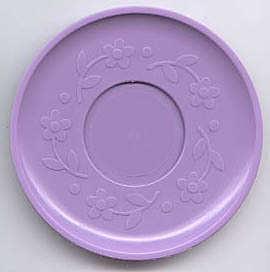 Description: Round lavender (light purple) plate with a slightly raised edge. The raised edge has a slightly textured top around the rim. The inside rim of the textured top has 2 smooth rings and a smooth heart with 2 "leaves" below it on 4 sides of the plates. Description: Small round light purple coffee cup saucers with a recessed circle in the center to hold a coffee cup in place, and 5 dots and flower imprints around the rim. Measures 3-1/2" diameter. Marked "©1982 FISHER-PRICE TOYS" on the bottom. 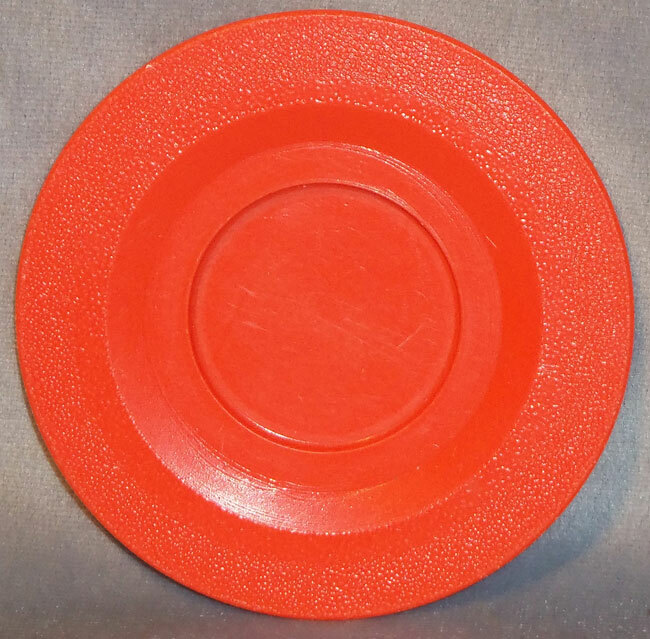 Description: Round red plate with slightly raised edges. The top raised edges have a slight "stucco" pattern/texture. Bottom center of plate is marked, "F-P TOYS". Measures 4-5/8" diameter. Description: Small round red coffee saucer with slightly raised edges. The top raised edges have a slight "stucco" pattern/texture. Bottom center of saucer is marked, "F-P TOYS". Measures 3-1/2" diameter. Description: Round silver plastic personal-size pizza pan/plate. The edges of the pan are slightly raised. 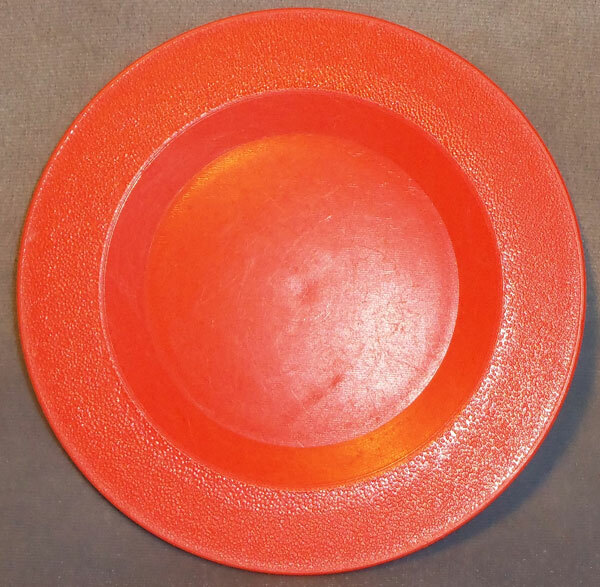 Back of plate is marked, "©1988 FISHER-PRICE, DIVISION OF THE QUAKER OATS CO." Measures 5-1/2" diameter x 5/16" thick. Description: Small round white plate with a small picture of a red and black bear's face in the center. Description: Small round white plate with a small picture of an orange and brown bear's face within a yellow circle. The bear face is off-set from the center, not in the very center of the plate. Description: Round white easy-clean plate with blue dirty spots that wash away to white when wet! The edges of the plate are slightly curved upward. Description: Round white plate with a red ring around the rim. The ring has red and white checkers on 4 sides. The bottom of the plate is marked "©1990 FISHER-PRICE, MADE IN USA". Measures 5-3/8" diameter. Description: White plastic plate with two blue rings around the rim and a red heart with blue "leaves" on 4 sides of the plate. Measures 5-3/8" diameter. 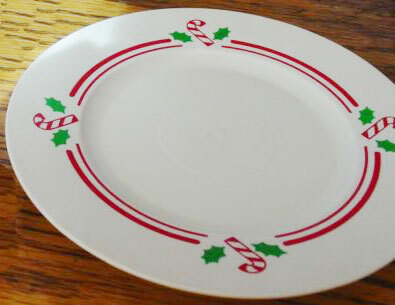 Description: White plastic plate with two red rings around the rim and a red heart with a candycane between 2 green holly leaves on 4 sides of the plate. Bottom of plate is marked, "F-P TOYS". Measures 5-3/8" diameter. Description: Round white plate with no decorations nor imprint molds. The edges of the plate are slightly raised higher than the center of the plate. Back of plate is marked, "©1990 FISHER-PRICE, MADE IN USA". Measures 5-3/8" wide. 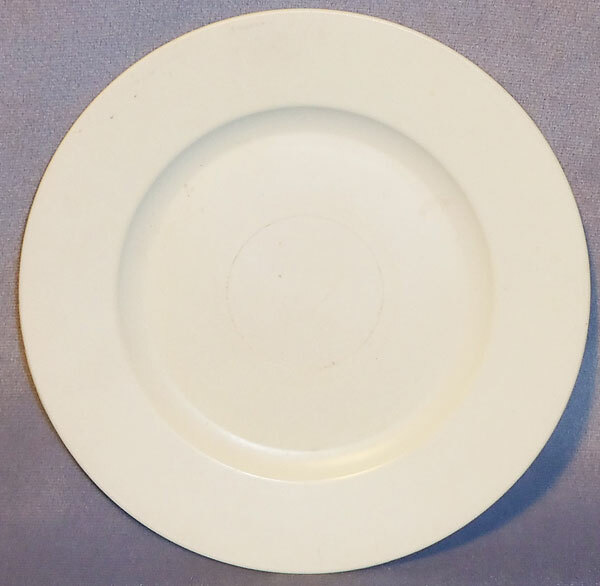 Description: Round white plate with a slightly raised edge. The raised edge has a slightly textured top around the rim. The inside rim of the textured top has 2 smooth rings and a smooth heart with 2 "leaves" below it on 4 sides of the plates. Bottom center of plate is marked, "F-P TOYS". Measures 4-5/8" diameter. 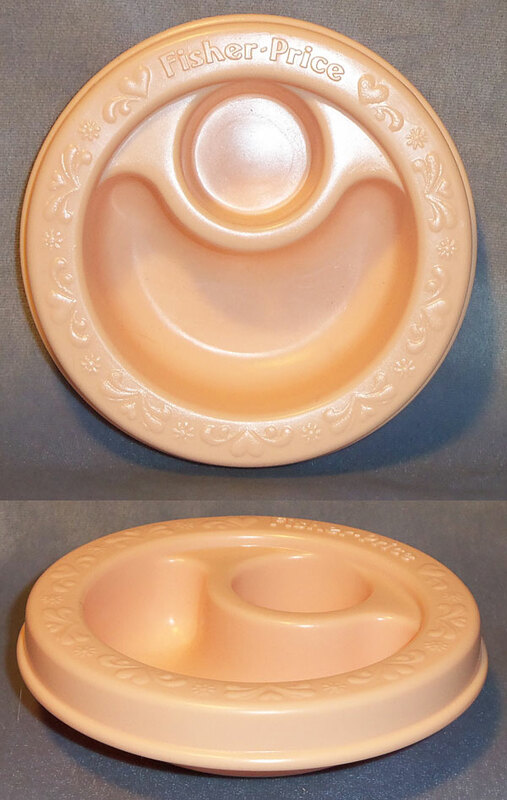 Description: Round white warming dish with 3 compartments to put pretend baby food in. 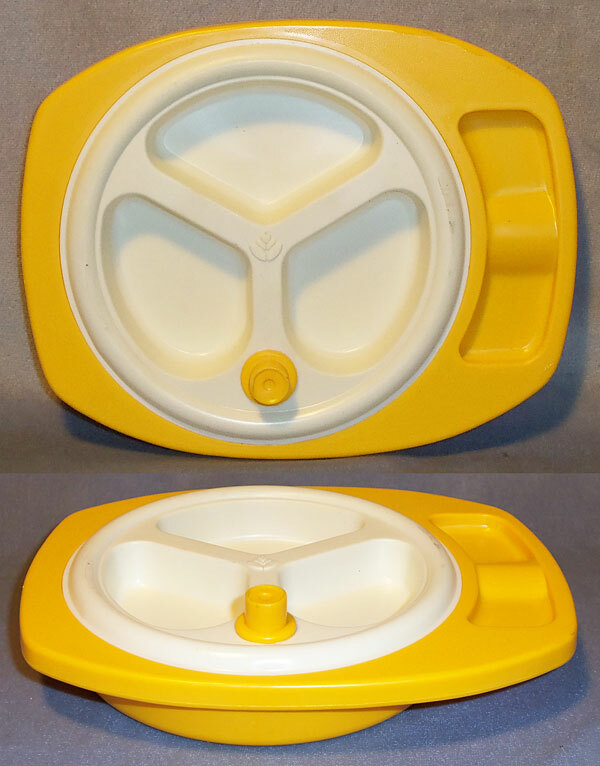 The dish has 2 small handles on the sides, each marked with a "Fisher-Price" imprint. 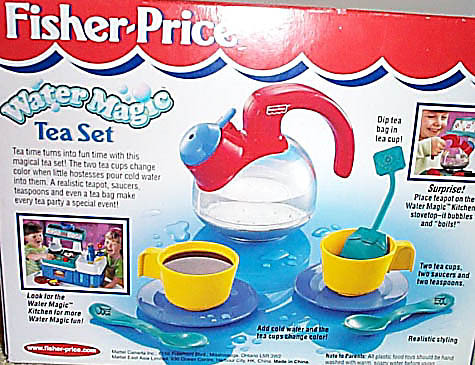 Bottom (under one handle) is marked, "2178, ©1995 FISHER-PRICE INC.". Measures 6-7/8" long (handle to handle), 5-1/4" wide x 3/4" tall. 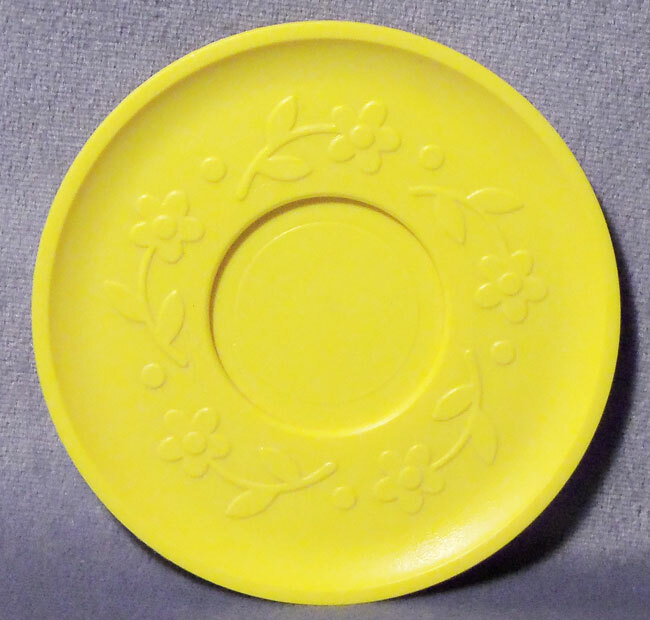 Description: Round yellow plate (5-3/8" diameter) with no decorations nor imprint molds. The edges of the plate are slightly raised higher than the center of the plate. 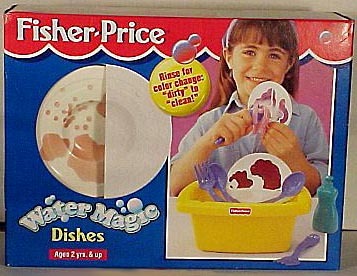 Back of plate is marked, "©1990 FISHER-PRICE, MADE IN U.S.A.". 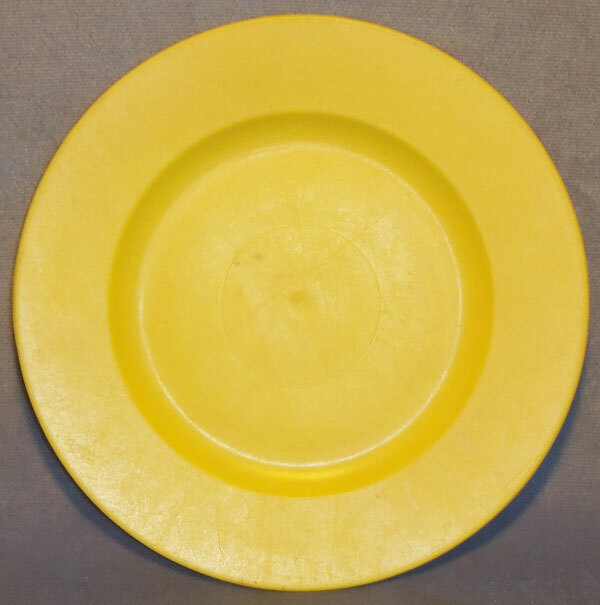 Description: Round yellow plate with checkerboard imprints around the edges. Description: Round yellow saucer that has a ring of flowers molded into the plastic around the edges. Bottom of saucer is marked, "681 ©1982 FISHER-PRICE TOYS DIVISION OF THE QUAKER OATS CO., MADE IN U.S.A.". Description: Yellow warming dish with a round white plate in the center. 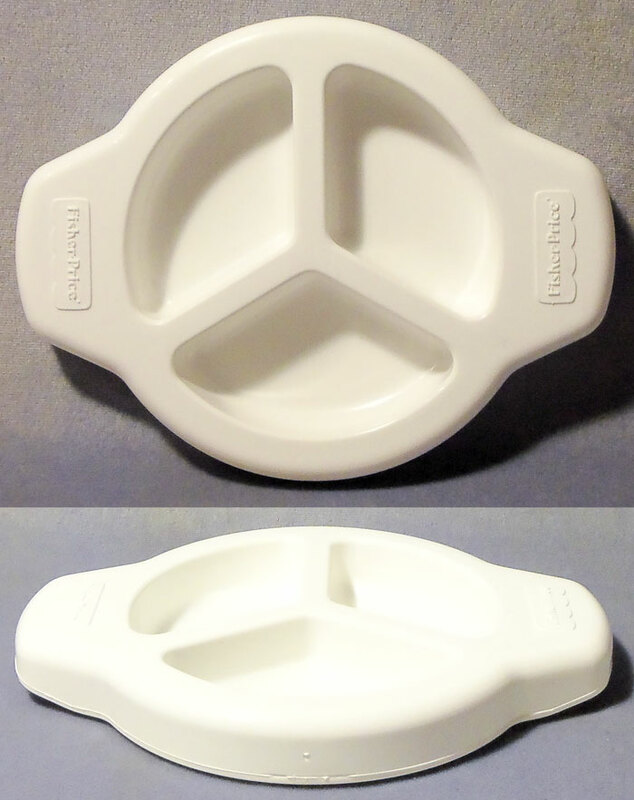 The plate has 3 divided compartments to put pretend baby food in. The dish has a yellow knob for pretend filling with warm water. Bottom of base is marked, "2150, ©1986 FISHER-PRICE, DIVISION OF THE QUAKER OATS CO.". Measures 7-1/4" long x 5-5/8" wide x 1-3/4" tall.